This week on the show we have mom boss Cielo Castro, Chief of Staff at Fairlplex to speak on how she navigates motherhood of TWINS and her new job/ career move. We also speak on work-life balance with a 10-12hr day, putting her mom guilt aside for her career and how she makes it all work at home with her husband's help. We also talk about all the new exciting things at this year's LA County Fair in Pomona. With Cielo's help, the fair has become so much more family-friendly and she shares with us all the ways we can all save. Before the interview, Bricia and Paulina reminisce on our Super Mamás Night Out event! Thank you ladies for making this one the best event yet! For more information and pics, click here. Also! Want to visit the LA County Fair this year? Visit our SM IG to learn how YOU can win a family 4-pack to the fair and/or use the LACOUNTY code for 6.60 entry on September 2nd! The fair runs from Aug. 31 – Sept. 23 (Closed Mondays and Tuesdays except Labor Day, Sept. 3). For more information about the LA County Fair visit the LA County Fair website, Facebook , Instagram and Twitter & Fairplex's Instagram. BIO- Cielo is Chief of Staff at Fairplex, a nonprofit, 501(c)5 organization that leads a 487-acre campus proudly located in the City of Pomona. Fairplex is a public-private partnership with the County of Los Angeles and is home of the LA County Fair and more than 500 year-round events. She came to Fairplex after serving as Transparency Officer for the City of Los Angeles Office of City Administrative Officer, acting as executive liaison with external stakeholders and providing oversight support for the City’s $8 billion budget. Cielo was previously Deputy to Los Angeles County Supervisor Hilda Solis, where she was responsible for discretionary grantmaking; staff hiring, recruitment and development; and policy issues including immigration, housing and community development. Cielo served the Obama Administration as Special Assistant at the U.S. Department of Housing and Urban Development in Washington, DC, where she advised the Assistant Secretary of Community Planning and Development on policy and political matters regarding a $50 billion grant portfolio and over 1,200 grantees. Previously, she had seven years of experience working with elected officials as Director of Constituency Services with the National Association of Latino Elected and Appointed Officials (NALEO) Educational Fund, and in outreach roles with the National League of Cities. (11:27): How did you get started with Fairplex? (14:53): Where did you get your masters? (17:20): What is life with twins? (18:17): How did you transition from your new role & motherhood? (20:01): How did having kids help you in your field? (21:44): How do you plan your schedule? (25:30): What did you family say about your marriage dynamic? How did that conversation start? (33:45): What is it inside of you that helps you put your mom guilt aside? (38:50): How long have you been prepping for this? (39:10): When does it open? & where is it? (40:15): Have the twins been out to the fair yet? (41:28): The theme of this year’s fair! (46:25): How big is your team? (55:21): Animals at the Fair! (59:24): Cielo recommends everyone sign up for that Amazon Prime subscription! Get on it, ladies. Our keeping up with the Super Mamás episode is back with a special back-to-school themed episode. The first day back to school is right around the corner and we discuss Paulina’s experience with Sabina’s school, Bricia’s efforts to get more involved, uniforms & school lunches, the ratio of kids to teachers and our school year goals. But first, Paulina talks about her weekend with all 4 kids (is baby #4 on the way? LOL) and Bricia fills us in on he romantic trip to Nashville. We want to know what your school year goals are! Comment them below. (5:45): Bricia's trip to Nashville! (14:25): Is baby #4 on the way anytime soon? (45:23): In a rush to a birthday party and not prepared for a gift? Hit up your local Barnes & Noble, pick up a book and get it wrapped for FREE. Yes, free! Thanks, Paulina! (52:47): Bricia's in love with her ABLE bag that she purchased in Nashville & her Goe Oil from Jao Brand. Also, if you're ever in Nashville, hit up White's Mercantile! This week on the podcast we have the ultimate mom boss, Mari Ronquillo from Lyme Lite Media to speak on the challenges of single motherhood, building her very successful business from the bottom up, her pure hustling mindset and the motivation behind achieving her dreams. Mari keeps things very real and opens up about all the struggles she faced to show us all that no matter what obstacle you face, you can & will overcome. Before the interview, Paulina and Bricia discuss how both their summers are going. Bricia is heading to Nashville this weekend, while Paulina is going to take care of her kids plus little Eddie. We also get into to Bricia's first playdate experience and the proper ettiequte. What are your playdate guidelines? Comment below! Lyme Lite Media and PR was founded by Mari Ronquillo in 2007. 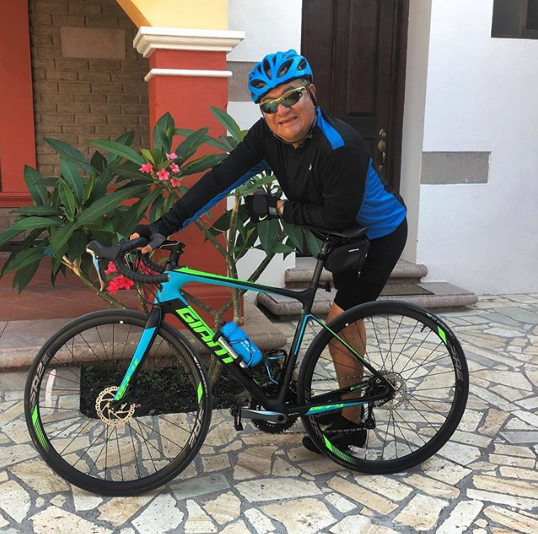 Raised by immigrant parents, mother from Mexico and her father from the Philippines, they instilled hard work and passion into her at an early age. While working as an intern producer at 93.5 KDAY Los AngelesMari realized that her gift was far more then production, but to help artists get exposure. Her first opportunity to get an artist exposure ended up becoming a success and led her to event coordinate all in one for one of the biggest concerts that year. 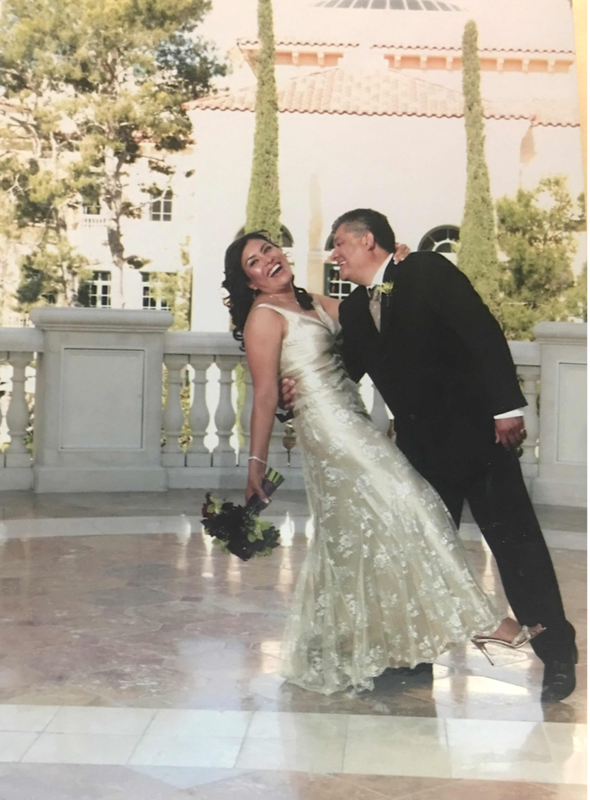 Mari then Graduated with her BA in Multi Media Production from Cal State Northridge, and started Lyme Lite Media -a full service Public Relations firm that would soon become one of the most sought out boutique PR Firms within the business. (16:52): Who is Mari Ronquillo? (17:50): How did you get started in the industry? (23:34): What got you through those moments when you felt like you couldn’t do it? (34:40): What do you attribute your success to? (45:16): How has being a single mom has empowered you? (46:57): Do you practice self-care/ how? (48:26): What would you say to other single moms? (59:08): Mari's pick is a book she could not put down on her vacation, Angie Martinez's, My Voice: A Memoir. Highly recommends it! (1:00:02): Paulina's HeartMoon Organics deodorant never fails her, especially during these hot and humid days in LA. Her favorite scent is the lavender one. (1:02:12): Bricia lists sooo many baking soda hacks. Did you know that if you can mix it with vinegar and clean the inside of your washing machine with it? Listen for more hacks. This week on the show, we have the incredibly knowledgable Stacie M de Armas from Nielsen to shed light on the power of the Latina community and how we can leverage hard data to empower ourselves. Stacie is a single mom of 2 and is the Vice President Strategic Initiatives & Consumer Engagement and a Public Affairs Leader within Nielsen’s Diversity & Inclusion practice. For those of you interested in marketing, advertising and brand building- this one's for you! Before the interview, Bricia and Paulina discuss their weekends. Bricia talks lashes, from RevitaLash, Too Faced Waterproof mascara, to the reason why she and Paulina have short eyelashes. Also, is the tooth fairy actually real? It looks like she is in Paulina's house. Stacie M. de Armas is a subject matter expert, a thought leader and a frequent speaker on the U.S. Hispanic market. She works with major brands, multicultural organizations, advocacy and community leaders and consumers to uncover trends, and better understand and tap into the power of the U.S. Hispanic market. de Armas joined Nielsen in 1998. She has previously served as vice president of community alliances, vice president of multicultural advocacy and marketing, and director of Hispanic marketing. Stacie sits on the advisory council of the Association of National Advertisers- AIMM Initiative; and sits on the Board of Directors for the Culture Marketing Council (formerly AHAA). In 2017, she was honored by the Imagen Foundation as one of the Most Powerful and Influential Latinas in Entertainment and in 2014 as one of LATINA Style Magazine's top ten Latina executives. She is also an adjunct professor of Qualitative Research at California State University, Los Angeles in the college of Business & Economics. (13:40): How did you get started in the industry? (16:42): What are some challenges that you faced during your journey? (18:42): What have been your breakthrough moments? (27:34): Nielsen came out with a report last year, Latina 2.0, which you spearheaded and it shines light on the power of the Latina. Where does the millennial Latina mom/ single moms fits in there? (31:35): How can we leverage this data to empower us? (36:42): how can we position ourself to go after those general market dollars? (41:39): Whats next for Stacie? (51:53): Stacie's Google Home is her frictionless access to everything she wants (Maluma included). (56:26): Paulina opens up the "poop gates" and we talk everything #2. Her obsession right now is Poo-Pourri. Also- know of a poop-specialist? Send Bricia a message. Hello ladies! This Tuesday we have an episode that'll make you keep a gallon of water right by your side. We have the amazing Natalie Aguilar- Human, Woman, Nurse, & Aesthetician in the studio and we talk EVERYTHING skincare. From the absolute necessary products you need, serums, facials, jade rollers, dark eye circles, IV drips, micro-needling, botox & so much more! But before we get into all that, Paulina's kids are back & Bricia speaks on the passing of LA Times restaurant critic, Jonathan Gold. This is a long one, BUT you'll for sure have all the tools you need to get your GLOW on. As a women practicing skincare for over sixteen years, Natalie Aguilar has been able to combine her medical knowledge, as a nurse, alongside her expertise as an aesthetician to create some of the most luminous, and healthy skin, that you see in Hollywood and around the globe. As a proud owner of Afterglow Beverly Hills, Natalie has fulfilled one of her many prestigious physicians, and brands, in the world including La Mer, Shu, Uemura, YSL and Chanel. Natalie serves as a global educator, for others in the skincare industry, and loves to teach her methods and protocols for customized skincare. She proudly believes that healthy skin is truly the most important factor in achieving a beautiful, luminous and radiant complexion! (13:34): Who is Natalie Aguilar? (14:35) When did you open AfterGlow & where is it located? (19:40) Stress, Stress, Stress! What does stress do to our bodies? (26:40): How do I determine what to buy? What’s right and what’s not? (27:54): Advanced skin care - what’s up with serums? (29:00): Do you recommend rotating out your serums? Or stay with the products we love? (31:52): Benefits of grape seed oil! (34:00): What does collagen do for you? (34:56): How often should I get a facial? (36:27): Whats up with Jade rollers? (36:49): What exactly is a facial? (38:04): What is the best face cream for wrinkles on the forehead & under eye? (40:15): How do you start using Retinol? (41:36): What is the best thing for dark circles under your eyes? (46:00): What chemicals in products should we avoid? (49:50): What is an IV drip? & what are the benefits? (52:46): Whats the difference between getting vitamins through a serum and getting them through a drip? (1:00:13): What is the best treatment for manchas aka Malasma and how to prevent them? (1:05:26): What are some recommended treatments for acne rosacea/ acne scars? (1:09:03): How often should you scrub/exfoliate your skin? (1:09:30): Botox- is it safe? Would you recommend? Any alternatives? (1:14:34): How can I improve my skin through diet? Happy Tuesday, ladies! This week on the podcast we have Veronica Monroy-Ferrer, better known as “Veronica M”. 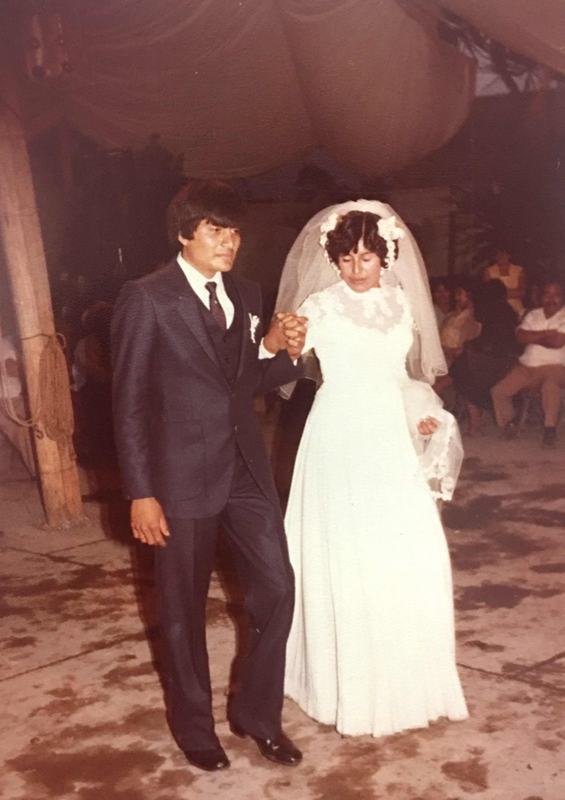 Veronica Monroy-Ferrer first joined the fashion world in 1996, selling her well known miniskirts at the Fairfax swap meet in Los Angeles, California. 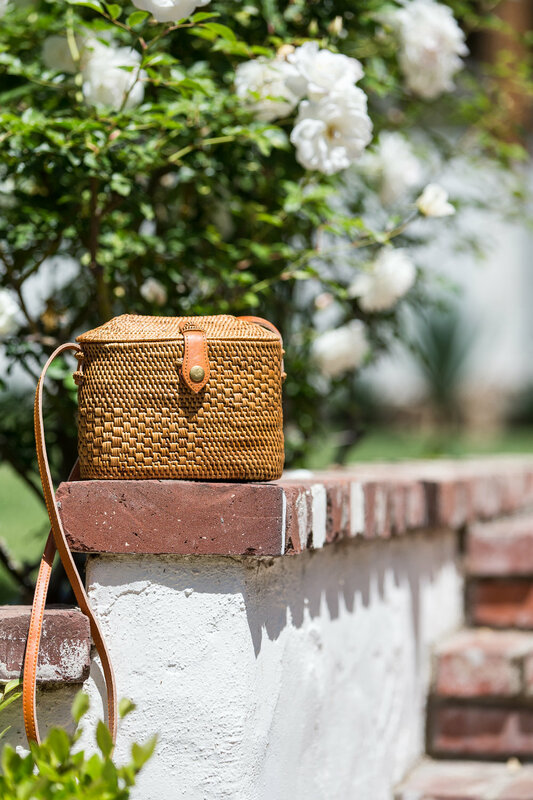 Daughter of a successful Peruvian seamstress, Veronica learned early on the secrets to designing clothes and acknowledging the modern woman as stylish, strong, and career-minded. Among a handful of auspicious local fashion designers, Veronica has made a name for herself by designing the perfect fusion of classic styles and vintage patterns with a bohemian twist. Growing up, her weekends consisted of fabric shopping with her mother and helping to cut out patterns at the age of seven. It was then that she realized the endless fashion possibilities by collaborating with bright colors and lively prints. The Veronica M brand is now synonymous with fun and bold prints. In 1997, the demand grew for Veronica's amazing fitted miniskirts and she opened her own store, Scala on La Brea Boulevard. Soon after the opening of her store she began receiving request for "Veronica M" for local boutiques and private label chains. This began her wholesale division that is still expanding today. In 2000, Scala closed and reopened as Veronica M located on Beverly Boulevard in Los Angeles, CA. Though it has since closed, we thank all who have supported this location throughout the years. In 2014, PeopleStyle watch named Veronica M jumpsuits the most flattering, perfect jumpsuit: "It skims your curves in just the right way." Veronica M continues to make a statement and strong impact on fashion. 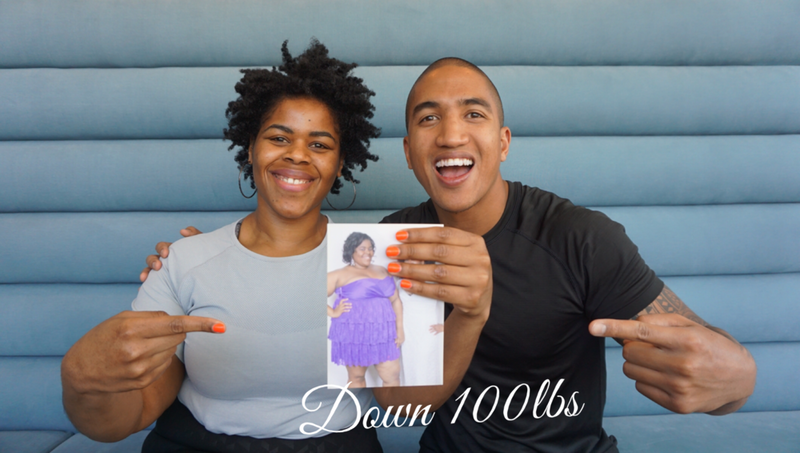 Veronica believes that every woman should not only look their best, but also feel their best." But first, we address a sensitive topic that we thought it was necessary to discuss. (18:40): How did you get started? (21:01): How did you go from Swap Meet to having a little store? (22:47): Where did you get inspiration for your designs? (30:36): When did the kids come? (33:38): What fashion trends should we look for this summer and upcoming fall? (40:00): Veronica M is LOVING zumba! Pick a sport or activity that will make you feel incredible about yourself. (40:40): Paulina's tip is to keep hydrating with LOTS of H20. (42:50): Bricia is on the dry-brushing your skin trend. This week on the podcast, we are focusing on maternal mental health & how to strengthen our marriages with licensed clinical social worker, Denise Vite. Denise has been working in mental health for 12 years and is committed to providing mental health therapy that is compassionate, empowering and culturally responsive. She provides therapy and workshops to children, teens and postpartum moms in her part time job at a Kaiser Permanente psychiatry clinic. 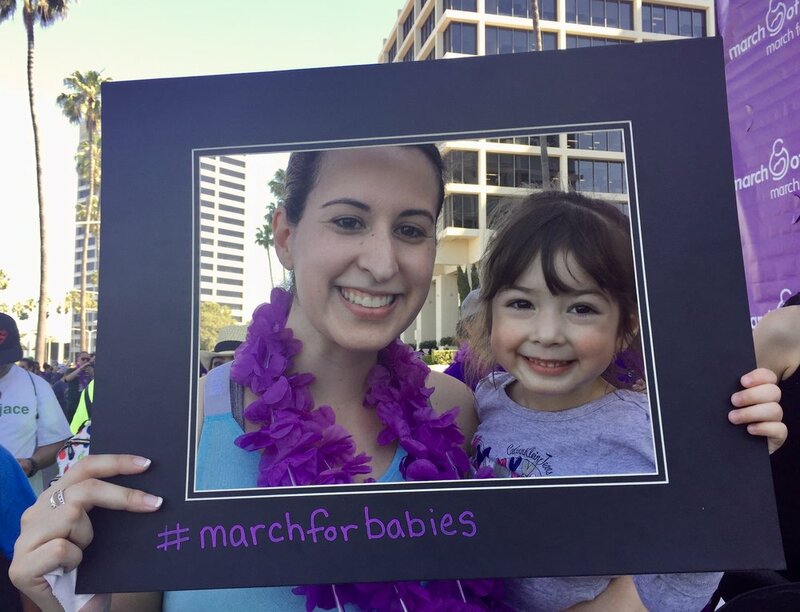 After going through her own personal struggles as a new mama, Denise realized how critical it is for mamas to have more support and how much more needs to be done to break the stigma around maternal mental health. It inspired her to specialize in the treatment of prenatal and postpartum depression and start her private practice, Compassionate Wellness Counseling, in 2017. Denise supports couples through their transition to parenthood utilizing a research-based workshop called Bringing Baby Home. She also facilitates pregnancy and motherhood circles at Unfold Yoga in Brea, Ca. To inquire more about Bringing Baby Home workshop dates, receive a free phone consultation, or to discuss bringing this workshop to your organization, please contact Denise by email & visit her website for more details. 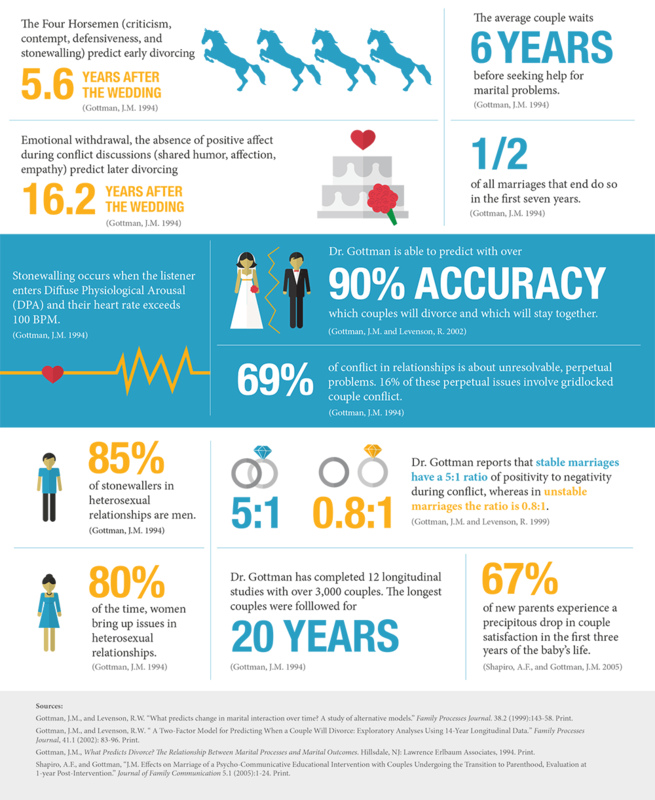 Denise recommends practicing the relationships tips we discussed with the Gottman Card Decks app. Opt for a wellness day. Infrared saunas with your husband, anyone? Happy 4th of July, sisters! When we think of this particular holiday, it’s all about backyard fun & fireworks. But considering our political climate today, we brought in actor, activist and our friend Kendrick Sampson on this show this week to speak on current issues & subjects we usually feel uncomfortable talking about. Kendrick’s activism revolves around reforming the criminal justice & immigration system while advocating for intersectional racial justice as a whole. Before we into it, Paulina and Bricia recap how their keeping up with the World Cup (Remember, drink a tablespoon of apple cider with warm water in the morning) & the progress of our GoFundMe Campaign. You can follow Kendrick on Instagram, Facebook & Twitter as @Kendrick38. Paulina encourages watching the Netflix documentary 13th to learn about America's prison industry and it's mass criminalization history. Bricia just finished listening to the podcast, Making Obama by WBEZ Chicago. Queue it up! & back to the interview! Arthur is the founder of The Training Ground Zero, an online fitness and nutrition platform that specializes in helping women find their true superpowers while learning the principles of working out and making the best choices based on their current situation(s). Identify your current obstacle- What has prevented you from accomplishing your goal in the past (time, discipline, education, etc.)? To learn more and get in contact with Arthur, follow him on IG, @ArthurSmithJr and send him a DM! Paulina's tip is to find a physical activity everyone in the family can enjoy together. Her family's is dancing, what's yours? Arthur's tip is to understand the power we all have within to help ourselves accomplish our #goals. We all can do it! Also, if you're shopping for gym equipment, rather than the traditional weights, invest in comfortable shoes, a yoga mat and the right coach for you. Gym equipment isn't always necessary because your body can act as the best resistance training. Liz's passion for connecting people inspired her to create WORDAFUL, which is derived from the phrase "words are powerful." Currently featured on the OWN Network and through weekly videos and live experiences, Liz showcases feelings of inspiration and motivation that have depth and meaning. You can find Liz on Instagram, as @LizHernandez and watch/follow her series, WORDAFUL on YouTube, Facebook, Twitter and Instagram. Liz also gives us a great tip: learn a new skill right before going to bed! It will help you retain the information even better. Paulina is loving all things baby right now, especially her Dr. Brown's baby bottles. She uses these wide neck glass bottles with Zixta all the time. Bricia is obsessed with HBO's series, Being Serena. Being Serena is a documentary series chronicling tennis icon Serena Williams at a pivotal moment in her personal and professional life. It's AMAZINGGGG!! This week, Paulina is officially back to tell us ALL the chisme from her Oaxaca trip. From spending 7 hours in the Tijuana airport with 3 kids, to her husband getting into a freak accident (FIREWORKS ARE NOT TOYS) & to rebooking her airplane ticket for the second time 😳 - to say the least, the universe and/or her chakras were not aligned. To speak more on chakras (& so much more), we have the FABULOUS Millana Snow as our guest this week on the show. Millana Snow is a former New Yorker now living in Venice, CA with her German Shorthair Pointer, Aria. A model and actor for over 12 years, Millana is also a Reiki healer, meditation teacher and Founder of Serene Social, SereneBook.com and the new WellnessOfficial.co; an interactive online marketplace that features the best-of curated practitioners and brands from the global wellness community -launching S/S18. 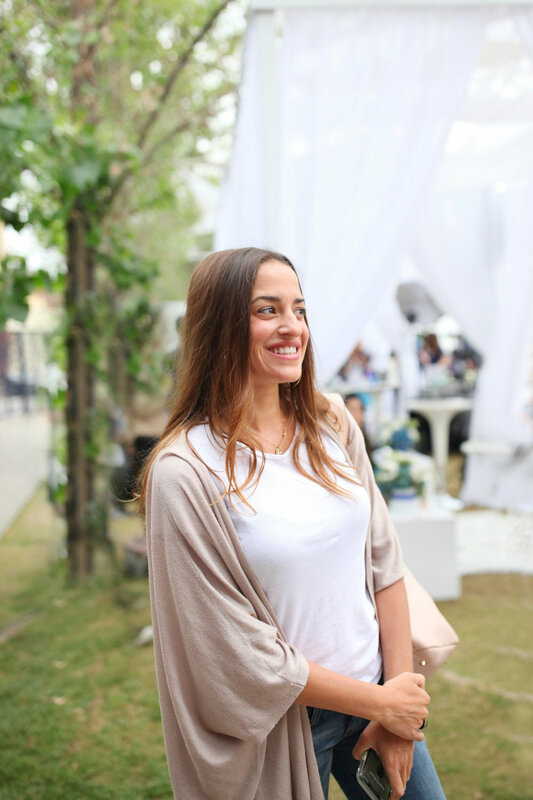 Her passion is to connect, empower and support others to heal themselves by expanding consciousness in their everyday lives. Millana, has always lived in a world of contrast, spending her childhood reading the Bhagavad Gita and her tarot cards, she went on to the world of fashion and entertainment becoming the winner of Project Runway and working with clients like YSL, Cover Girl, L'Oreal and Gant as well as working behind the scenes in publishing, public relations and creative direction for VIBE, Uptown Magazine, Vespa and Porsche. Today Millana has integrated these worlds by leading workshops, meditations and talks at NYU, Syracuse, Summit LA17, Soho House, Lululemon, Alexander Wang and more. What do ~*vibrations/high & low frequency*~ mean? How can we get aligned with our chakras? What is our third 👁 used for? What are some tips for people who want to start meditating/ be more connected with themselves? Paulina is loving Oprah & Deepak's 21-Day Meditation Experience App. Our third and final part of our 3-part Super Mamás Social series is coming to an end 😩 We have the incredible Chef & Author Marcela Valladolid to close it all out. Also, Paulina is back (but we're going to save the Oaxaca "cheese" for next week)! 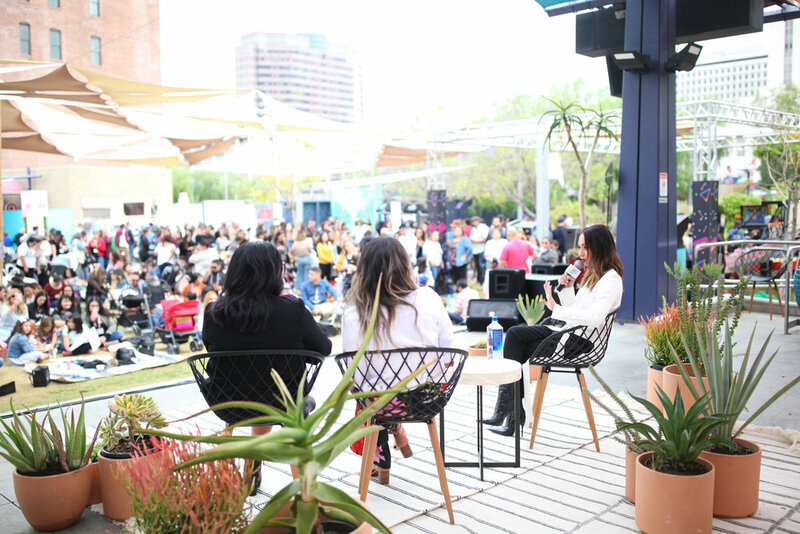 The theme of the panel was "My MAMA made me" and we asked Chef Marcela how her mom influenced how she parents today & if there are things she does today that she vowed she'd never do as a parent. We also talk about self care, who see considers part of her tribe and how she keeps Spanish alive in her household. Thank you to our sponsor, AT&T for making our dreams come true! 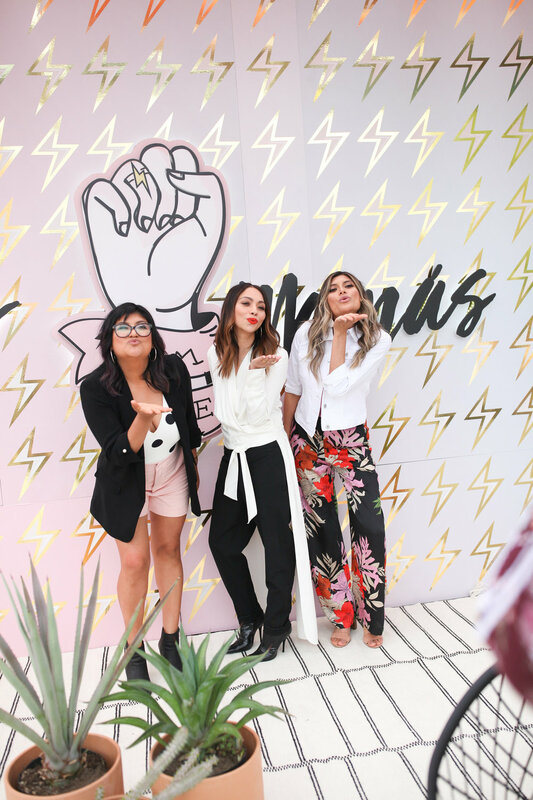 Part ✌🏽of our Super Mamás Social Panels is here! We are so thrilled to relive our MOMboss Life interview with celebrity stylist, Monica Rose. Distinguished as one of the most socially viable celebrity stylists in the world, Monica Rose has successfully converted emerging talent into bonafide tastemakers. Current and former clients include: Chrissy Teigen, Chanel Iman, Miranda Kerr, Nicole Trunfio, Behati Prinsloo, Kaia Gerber, Gigi Hadid and the Kardashians to name a few. 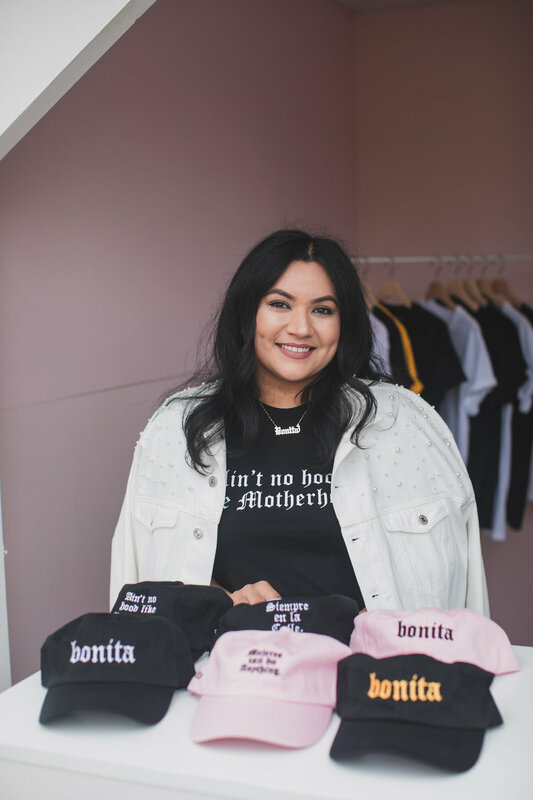 Monica is a self-made entrepreneur who continues to create and curate signature looks for some of the industry's most-watched A-listers and influencers alike while raising her three children with her partner, former professional skateboarder Sal Barbier. As Sylvia explains, fresh avocados are a great option for expecting mamas. The Academy of Nutrition & Dietetics lists avocados as a healthful fat that can help women achieve a balanced diet and have a healthy pregnancy. Healthy avocados contain naturally good fats which are known to be important for normal growth and development of the baby’s central nervous system and brain. Plus, fresh avocados provide a good source of folate per serving which is important for developing a baby’s brain function and reducing the risk for premature births and birth defects. Paulina also discusses how she incorporated avocados into her own diet while she was pregnant, especially after being diagnosed with gestational diabetes & it was so easy! Avocados are incredibly versatile. We also receive great tips on how to pick the right avocado at the supermarket & what to do with those avocados that are passed their ripeness #selfcare. For more information on pregnancy nutrition, visit Saborea Uno Hoy's Maternal Heath Advice section. Don't forget, for all you pregnant super mamas out there with the same love (and crave) for avocados, we have a very special contest opportunity for you taking place on Instagram now until May 30th. In the ABC’s of Prenatal Nutrition- Avocados, Bellies & Cravings contest you can share why you’re eating avocados during your pregnancy for a chance to win some great prizes. Check out our #SMSOCIAL18, AVOCADO CONTEST & OUR PREGNANCY CRAVINGS blog post for more details! Sisters! We are back with the first panel of our #SMSocial18, MAMAhood: The hardest Hood and Balancing it All with hustlers Rachel Gomez, founder of Viva La Bonita & Gemma Marin, actress and fitness model. This is the first part of our three-part series of our Super Mamás Social panels. How are you able to incorporate your babies in your work life routines? Do you find that you can accomplish more now that you have a baby? How do you manage to make time for you and your husbands/significant other? For all the ladies who couldn't join us this weekend, this is for you! Stay tuned for the upcoming panels with celebrity stylist Monica Rose & Chef Marcela in the coming weeks. This week on the podcast, we answer all your questions about water safety with Kidswim CEO & Master Swim Instructor, Lisa Cook. You asked and we answered! We cover when’s the best time to introduce your child to swimming, the truths and misconceptions of dry drowning, how to deal with kids being afraid of the water, pool/ocean safety tips and pool toys. Whether you have a pool at home or visit the beach and/or community pool, you will takeaway tons of valuable information that will help your child (and yourself) become more comfortable with swimming. Dry drowning is super rare (phew!) but Lisa provides us symptoms and action steps you can take if you suspect your child is experiencing dry drowning: Keep an eye on them for at least an hour after getting out of the pool, if you see signs of weakness or a abnormally bloated abdomen- call your doctor. 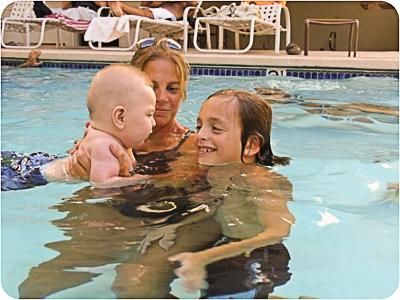 Start swim lessons without asking too much of your child. Ease them into it and don’t put too much stress on them. @ileana_82!!! CONGRATULATIONS!!! Please contact the kidSwim office at info@kidswim.org or by phone at 1- 888-579-7946 to claim your prize. Paulina's daughters have eczema and their doctor has advised against bubble baths BUT she found these awesome bubble pods that work perfectly with her daughter's very sensitive skin, TruKid Eczema Bubble Podz. Hooray for bubble baths! Bricia recently finished remodeling her backyard and her tip for everyone is to invest in outdoor lighting. It makes a huge difference and will create the perfect ambience for any backyard occasion. She got her's at Lamps Plus and wrote this perfect blog post about her Backyard Remodel Journey, here. The Super Mamás dynamic duo is back! Bricia has returned from Oaxaca and she and Paulina catch up on the last 3 weeks. Like, what is up with Paulina’s hand? & did Eduardo adapt to speaking Spanish while in Mexico? As Paulina and Bricia share their own experiences with being bilingual, they realize a lot about themselves and put their own Spanish to the test which will make you LOL. This week on the podcast we have our girl Natalia Koegen, founder of the Original Sueño blanket. Natalia started Sueño when her middle son, Jasper, was drawn to the colorful colors of the serape but could not take it to bed because it was too itchy. After not being able to find a company that had paired the serape with a backing, she decided to make it herself. Natalia is an entrepreneurial force of nature and during the interview she provides us with valuable advice that you can apply to your own business. We cover how Sueño got started, her strengths, her greatest business mistakes and how we all can’t do it alone. If you own a business or if you’re sitting on idea that you want to turn into a business, this episode is for you. Don’t wait for “the perfect time,” just do it. We also catch up on Elizabeth and Paulina's eventful weekend. While Elizabeth was in Portland, Paulina and Krista embarked on a community service trip with Scooby-Doo and Generation On! If you're interested in getting involved click here. Natalia is loving these two tech startups: Bolt, simple shipping with fast delivery & great rates and Indigo Fair, a platform that connects retailers with brands. If you're looking into wholesale, check this app out. Paulina recommends Quickbooks online for small business. It's super easy to use and only $10/month. Bricia gave her take on both SquareSpace and Shopify. While Squarespace is more user friendly, Shopify offers more plug-ins and has more detailed analytics. Depending on what you're looking for, each one has it's strengths and weaknesses. Definitely do some research.